How would you like to pay $150,000 for a Toyota Prius? That sounds like crazy town, but it's the reality in Singapore, where car prices are jacked up on purpose. It's enough to shock Vin Diesel, even though he plays an unflappable street racer/heist specialist in the Fast & Furious movies. Diesel and the other members of the Fast & Furious 6 cast were in Singapore recently to promote the movie, and rather than just do a boring, generic interview about the film, Razor TV had a clever idea: get the cast to guess the prices of cars in Singapore, then film their justifiably horrified reactions. In Singapore, the government intentionally tacks on super-expensive "permits" onto new car prices in order to reduce traffic congestion on the tiny island. This means that cars have astronomical price tags when converted to US dollars. 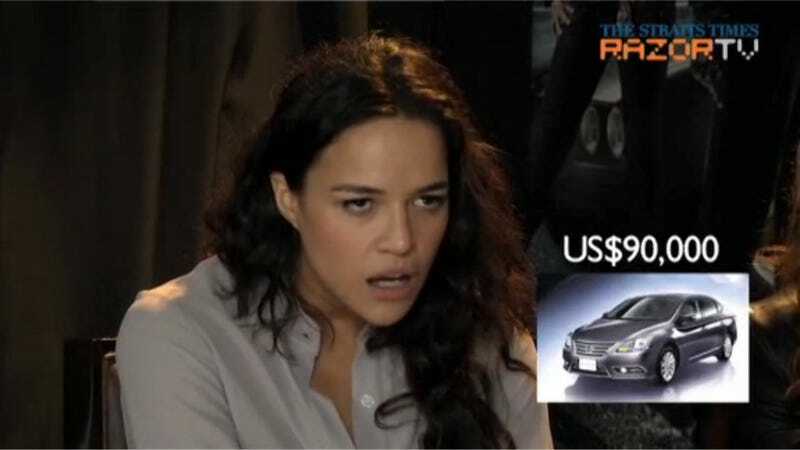 Understandably, Michelle Rodriguez is blown away by the fact that a Nissan Sylphy (or Sentra to us Yanks) costs $90,000. Gina Carano was also stunned that a Subaru BRZ costs $130,000 over there, although she didn't know what car that was to begin with. I see someone's not a Jalopnik reader. "Isn't Subaru a Japanese brand?" Rodriguez says. "It's being imported right down the block. It's not like you have to travel across the Pacific." It gets worse. A BMW 6-Series costs $330,000. Luke Evans is also shocked to learn that a Honda Accord costs $130,000. He guessed $60,000 initially but was way off. Next time you're bitching and whining about new cars being too expensive, just be glad you don't live in Singapore. And if you do happen to live in Singapore, I am so, so sorry. Click here to see the full interview. It's a fun one.